How to identify the true cause of your tiredness and what to do about it in order to regain your energy? When people tell their friends or their doctor that they are always tired, more often than not they are not taken seriously enough. Their condition is often too easily dismissed as just "normal tiredness" that all of us occasionally experience. But that's not always the case. If you're really tired all the time, and if your condition persists for weeks or even months on end, then your tiredness should be takenvery seriouslyand youshould do something about it. Our website will try to help you identify the true cause of your persistent tiredness and show you what to do about it. Hopefully, we'll be able to help you get rid of tiredness and start living a life that's filled with energy. So let's get to it. In those cases the cause of your tiredness is obvious and it's usually quite clear what you need to do in order to overcome it. But sometimes things are not so easy. Sometimes people feel tired even though they sleep as much as they need to (or even more than that), they eat the right kind of food and in the right amounts and, as far as they know, there's nothing medically wrong with them. In such cases, the first step to overcoming your tiredness, should always be determining the cause of it. Because of this, it would be extremely hard to identify which medical condition is causing your tiredness, based solely on this one symptom. The good thing however (or bad, depends on how you look on it) is that most of these conditions are accompanied with other symptoms as well. These other symptoms will, in most cases, make it much easier for your doctor to correctly diagnose you. So if you have any other symptoms that you're experiencing, no matter how small or insignificant you might think they are, go see your doctor. Describe everything that is bothering you and, hopefully, he'll be able to diagnose and treat you. If, on the other hand,your constant tiredness is the only symptomthat you're experiencing, your doctor will probably have a very hard time coming up with the right diagnosis. If that's the case, please continue reading here:Most Common Medical Causes of Tiredness. Here you'll find a more detailed description of the most common conditions that have one thing in common - tiredness is their first and most noticeable symptom. Is it possible that your lifestyle is the reason why you're always tired? Do you feel less tired during the weekend? If you take a couple of days off from work, what happens to your tiredness levels? When was the last time that you could just go through the day… without worrying at all… about anything? Do you eat healthy food… and in healthy amounts? Would you describe yourself as a fit person? If you had a chance to take a trip to a nice tropical island, where you could just lie on the beach sipping cocktails all day, never worrying about your job, your kids, or any of your usual responsibilities… And if you could stay there for a full month… or make that two months. Do you think you'd still be as tired as you are now? Answering those questions might give you some idea if your tiredness is related to a medical condition or if it's a direct result of the way you live your life. But answering questions such as these will not be able to give you a definitive answer. Not at all. Over the years we have noticed that most people, whose tiredness is a direct result of their habits and/or lifestyle, are not doing anything that is obviously wrong. They are simply making a lot of tiny little mistakes, which have a great cumulative effect, resulting in constant tiredness. Sometimes, the problem is reversed. Nothing is lacking from your diet, but you're eating something that you shouldn't. Here's more aboutfood and drink to avoid if you feel tired. And you should probably also read aboutcommon food allergies that could be causing your tiredness. And here's a short article that will give you a more general view onrelationship between food and tiredness. Everybody knows that sleep is related to tiredness. 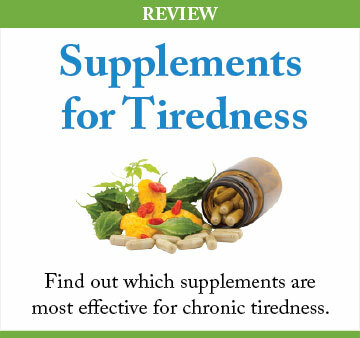 What most people don't know is that sleep problems are one of the most common causes of tiredness in adult population. But even though they are very common, most of these never gets diagnosed, and consequently, are never treated. The reason for this is that most people that suffer from sleep problems have absolutely no idea that something is wrong with the way they sleep. The only thing they do know is that they're always tired. If you'd like to know more about this, go to a more in-depth discussion ofcommon sleep problemsand we'll tell you how to recognize and treat some of the most common sleep problems that could be the real culprit behind your tiredness. I shouldn't neglect to mention that even if you don't suffer from an undiagnosed sleeping condition, there's a lot you can do in order to improve the quality of your sleep. Here's a nice article onraising the quality of sleep. It will explain how you can wake up more refreshed, energetic, and relaxed (and that's without resorting to more sleep). Stress will make you tired – could this be the main cause behind your tiredness? Being under heavy stress is exhausting. That's no secret. But what most people don't know is that even if you only suffer from what some people refer to as "normal stress", you will get tired. And if that goes on for extended period of time it might overburden your adrenal glands, leading to a condition that is known as adrenal exhaustion (also known as adrenal burnout or adrenal fatigue). Basically, this means that you'll feel tired all the time. If you think that stress might be one of contributors to your constant tiredness, go on and read more aboutstress and its effects on tiredness. There are many otherlifestyle factors that could be contributing or causing your tiredness. Some of those areexercise,overuse of caffeineand/orother stimulants, and even such simple things asnot getting enough water. What is the relationship between sleep and tiredness, how much sleep should you aim for and what is quality of sleep? Also, find out more about good sleep practices and common sleep problems and disorders. What conditions are the major causes of tiredness and what measures can you take to help yourself recover from fatigue? Chronically stressed people become tired because of the effect of stress on their adrenal glands. However, there are some useful relaxation techniques, exercises and foods that will help you manage stress and ease your fatigue. We are exposed to many sources of toxic substances that can accumulate in our body and strain our organs and immune system. These toxins can make you feel chronically tired and cause a range of medical conditions.